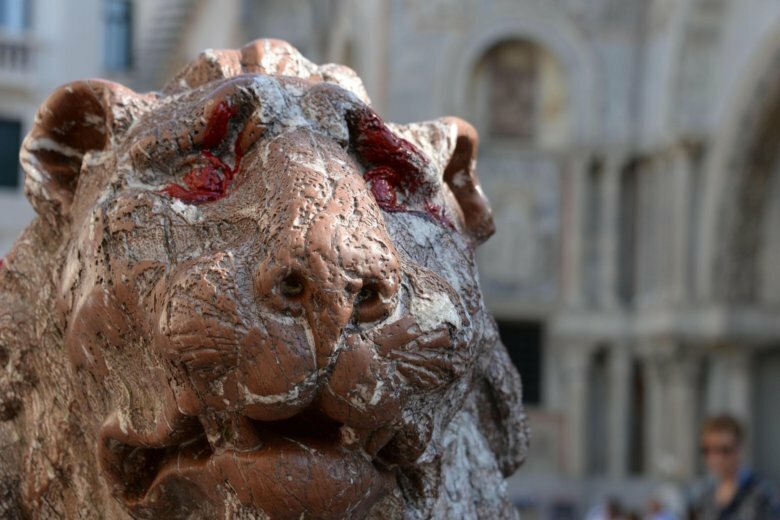 ROME (AP) — One of the two stone lions that stand guard next to Venice’s famed St. Mark’s Basilica has been splashed with red paint. Residents raised the alarm Saturday after noticing the paint on the eyes and mane of the red marble “leoncino” statue, located on a small piazza next to the basilica. The two lions, made by Giovanni Bonazza in 1722, are a tourist attraction, beloved especially by children visiting the adjacent basilica. Italy’s ANSA news agency quoted local police as saying video cameras captured vandals painting the statue at 3:58 a.m. and officers were searching for suspects. St. Mark’s Basilica and the elegant, colonnaded piazza that spreads out beyond it are among Italy’s leading tourist attractions.